A group of Tulane students posing for a group picture before their next activity in Santiago de Los Caballeros, Dominican Republic. Studying abroad is not out of the norm for the Tulane student experience. According to the Office of Study Abroad, approximately 600 Tulane students make the decision to take their studies to the global level each year, with more than a hundred programs to choose from in over 40 countries. There are few study abroad programs, however, that have the intention to fully immerse students into the culture of the country to which they travel. Even fewer programs aim to do so in developing countries. According to the Institute of International Education, 54 percent of American students that study abroad decide to study in Europe, while other regions like Sub-Saharan Africa and Latin America recieve 5 percent and 16 percent of American students, respectively. As with any activity dominated by Eurocentrism, it can be challenging to talk about topics such as race or immigration in relation to populations of marginalized backgrounds in a study abroad program where white people are the majority. Fortunately, there exists such a program for Tulane students that hopes to overcome this obstacle. Every summer, the Office of Multicultural Affairs sponsors a 15-day cultural immersion program available to Tulane students. Past destinations include Senegal in West Africa and Jamaica. Every year, the program aims to tackle topics such as race and inclusion at an international level. 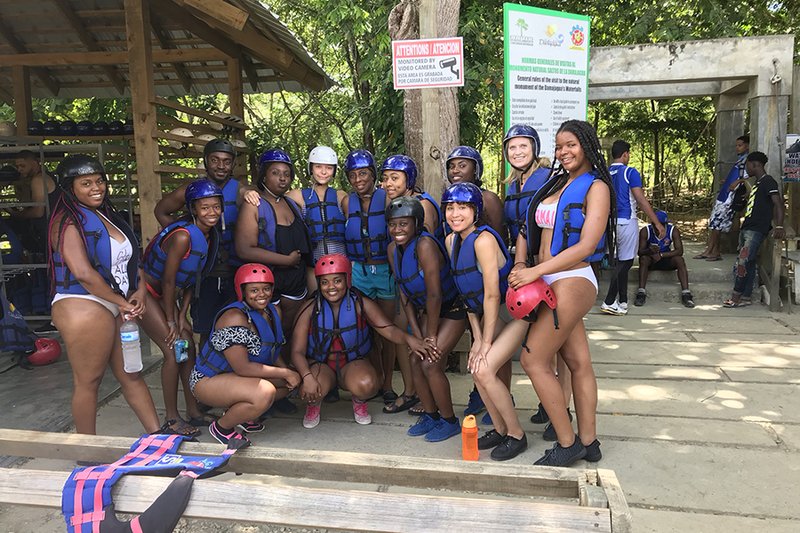 This year, a group of 20 students traveled to the city of Santiago de Los Caballeros in the Caribbean nation of the Dominican Republic. The theme of the excursion is “Race, Migration, and Identity,” therefore the students who embarked on this trip did so with the hope of digging into those topics. “Learning about how race, specifically blackness, is constructed in different parts of the world was probably the main reason I went,” sophomore Kaitlyn Crook said. Students went on many excursions, such as a day trip to the Batey, a former sugar plantation where Haitians worked and lived during the dictatorship of Dominican president Rafael Trujillo. Another day trip was to the marketplace of Dajabon, where students shopped Dominican and Haitian goods. Students were already aware of the relationship between the Dominican Republic and its neighbor on the same island of Hispaniola, Haiti. “I decided to go on this trip because I had always been curious as to how the Dominican Republic created and sustained an identity that gave the country as reason to declare independence from Haiti and remain a separate republic,” Odinga said. The Caribbean is home to about 30 million people of African descent. Like the U.S., the Caribbean was subject to European colonialism, which included exploitation of natural resources and made it a destination where kidnapped Africans were forced to work as slaves for more than a century. Haiti is a Caribbean country which, after its revolution in the eighteenth century, established itself as a nation for black people and a shelter from European colonization and enslavement. To this day, Haiti remains a predominantly black nation, and, unfortunately, its people face anti-black sentiment from Haiti’s neighbor, the Dominican Republic. Multiple students in the program reflected on how blackness in the Dominican Republic differs from the black experience here in the U.S.
As a result of the African diaspora, Latin America contains the highest population of people of African descent outside of Africa, followed by the United States. There is a history of anti-blackness in Latin America due to the racial caste system established by Iberian colonizers during the colonial times. As a result, Afro-Latinx people’s contributions to the many cultures of Latin America are often overlooked or forgotten. Fortunately, there is a current trend in rising representation of Afro-Latinx people here in the U.S., one that may very well continue to rise and spread throughout the globe. Hugo – I am so proud, such a great article! keep killing it!